A wonderfully different collection of cow themed Christmas. 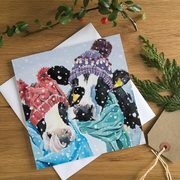 These Christmas cards are perfect for friends and family wether they be animal lovers, farmers or just appreciate something different! A fun twist on a classic.